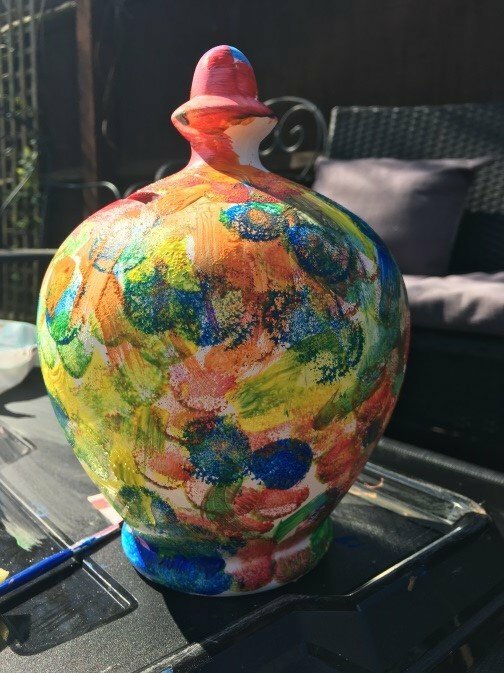 One of the things we at Scottish Friendly do for all participants in our Great British Savings Challenge is give them a savings pot. Even if they don’t actually use the pot to place any money saved from smarter shopping or other gains, the pot serves as a physical reminder (although at times it might feel like a poison chalice!) of the challenge in hand. However, as we’ve seen from last week’s challenge, in these days where money seems almost “virtual” through credit cards, online banking and contactless payments, actually having a physical sense of money helps regain a sense of the value of money for some of our participants. 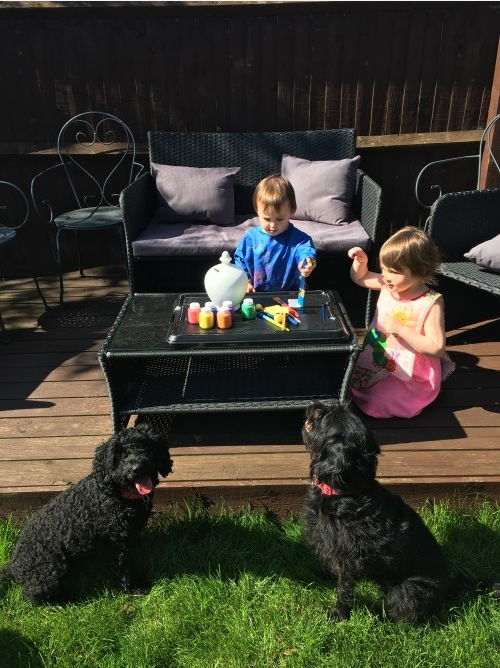 One of our participants, Natalie Gee, as you can see from the pictures below, really embraced the concept of the savings challenge by getting her two nieces, ably assisted by her two adorable dogs, to make the savings challenge even more unforgettable through the wonders of coloured paint and paintbrushes. How cool is this. On a more serious note – this is the world of financial services after all – we set Natalie a challenge to find out more about ISAs and she reported back that the challenge had been enlightening. As someone who’d previously been aware of cash ISAs, she’s now aware of stocks and shares (we call them investment) ISAs, Help to Buy ISAs and Innovative Finance ISAs. No doubt if Natalie had been doing her research last weekend, she’d also be aware of the new Lifetime ISAs too given the press coverage this new product has received. At this stage Natalie’s not quite ready to restart her saving or investment habit in an ISA because she recently had to stop payments in order to pay for holidays and her home but with a bit of effort further down the line, Natalie could be back on the savings path – not just painting her pot but feeding it too. Our other Savings Challenge participant, Nikki Watts, whom we reported on last week, is really embracing the challenge and the research project has opened up her eyes and has made her “desperate to be part of the ISA gang”. So far, Nikki’s interest lies in cash ISAs for herself and Scottish Friendly’s Junior ISA (an investment ISA) for her children. Remember stock market investments can go down as well as up so you, or the person on whose behalf you may be investing, could get back less than you’ve paid in. Tax treatment depends on individual circumstances and tax law may change in the future.